She is determined, focused, a woman of her words and a winner in all respects. 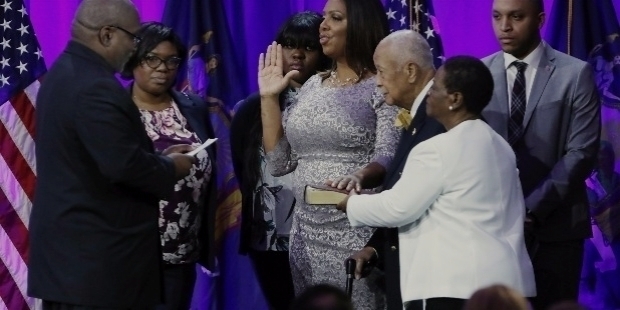 Letitia James made history in January 2019, when she was elected and sworn in as the State’s Attorney General of New York. She created history by becoming the first African-American woman to serve the post. Letitia James also is the first black woman to be elected to the State-wide office. 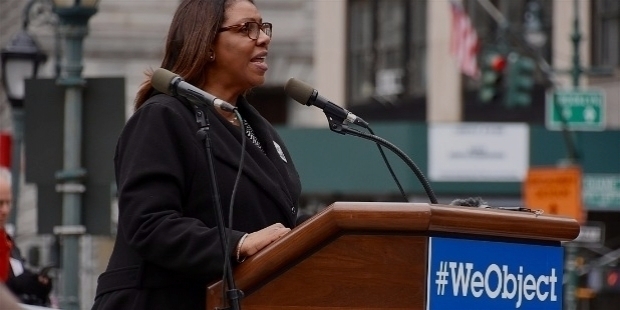 A goal-oriented individual, Letitia James wishes to create history in other ways. Letitia James had promised American citizen that she would investigate the corrupt President and his shady business dealings during her campaign. In the State Assembly’s first 100 days of legislation, she pushed for the passage, which would allow New York Attorney General to pursue State charges for any individual the President pardons on Federal charges. Letitia James has intelligently created a hedge against President’s efforts to undo convictions won by the Special Counsel Mueller or any other Federal prosecutors, who were investigating various associates of the President. The New York State Attorney General is planning to continue an ongoing investigation into Trump’s continued interest in his New York businesses, which may have violated the Constitution’s ban on emoluments. As per the American Constitution, a President is barred from taking foreign governments’ money. It is interesting to note that this particular issue is being pursued seriously by the District of Columbia and Maryland. The AGs of Columbia and Maryland are suing in Federal Court over the President’s interest in the Trump International Hotel. The Justice Department is trying hard to stop the case from proceeding. Letitia James is not leaving any stones unturned. Her office is continuing a lawsuit by her predecessor against Trump’s charity – the Donald J. Trump Foundation. The lawsuit is against the President and his three children – Donald Jr., Ivanka and Eric Trump. The Donald J. Trump Foundation had to be dissolved under Court’s supervision. Letitia James has won her first round against the President, because they had to shut the Donald J. Trump Foundation forever. However, the State is continuing to seek restitution. It is indeed interesting to note that Donald Trump is a bit scared of Letitia James, because he is afraid to mention her name in his tweets. The New York State Attorney General had fearlessly condemned the President in public during her campaign. She called him incompetent, ill-equipped and an embarrassment to all for what America stands for. Letitia "Tish" A. James was born on the 18th of October 1958 in Brooklyn, New York City, USA. Letitia’s parents Nellie and Robert James fled a life of sharecropping in the South. Little Letitia was raised in Brooklyn. She went to Public Schools in the New York City. 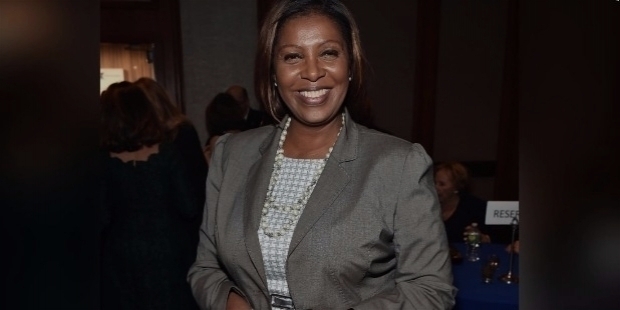 In the year 1981, Letitia James graduated from the City University of New York’s Lehman College with a B.A degree. After her graduation, Letitia James joined the Howard University School of Law in Washington D.C. She completed her Law degree. In the year 1989, Letitia James was admitted to practice Law in New York State. She is pursuing Masters in Public Administration from the Columbia’s School of International and Public Affairs. Letitia James was a good student. She served the Legal Aid Society as a Public Defender. She aimed at providing scholarships for young people, so she founded the Urban Network. Urban Network was a coalition of African-American professional organizations. In the year 1994, Letitia James promoted the Primary Healthcare Development Bill in the City Council. It expanded day care resources for working families across New York City. Letitia James has climbed the stairs of success one after another. She worked in the judiciary on former New York Governor Mario Cuomo’s Task Force on Diversity. 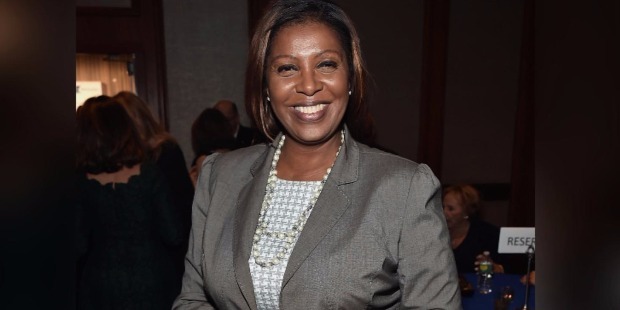 Letitia James even served as Counsel for Albert Vann, Chief of Staff for Roger L. Green in the New York State Assembly. She also served as Counsel in the administration of New York Attorney General Eliot Spitzer. In 1999, she was appointed the first Assistant Attorney General-in-charge of the Brooklyn Regional Office. She worked in various capacities. However, she focused more on consumer complaints involving predatory lending and other unlawful business practices. In November 2001, Letitia James ran for the very first time for the 35th Council District. She lost the race to James E. Davis. In the month of July in 2003, James E. Davis was assassinated by another politician, named Othniel Askew. Letitia James became the first member of the Working Families Party to win office in the New York State. She also became the first third-party member to be elected to the City Council since 1977. Incidentally, most of her success tends to establish new history. She later joined back the Democratic Party. On the 8th of November 2005, Letitia James was reelected on the Democratic line. A devastating fire broke at the Broken Angel House in Brooklyn on the 10th of October 2006. Letitia James represented Arthur Wood, Broken Angel’s owner. It was a pro bono case. Arthur Wood negotiated with the agency to keep his home. Wood was allowed to re-occupy Broken Angel with certain conditions from the agency. 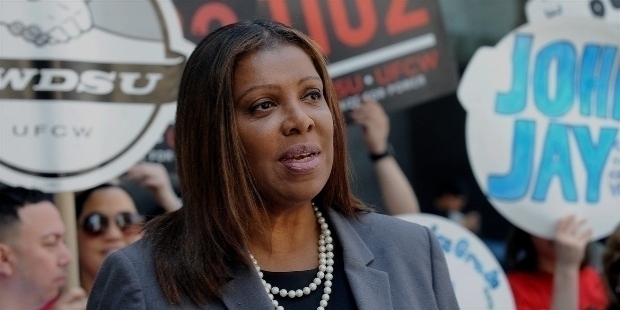 Letitia James has always fought with her heart and soul. She became the first to question irregularities and cost overruns in the subcontracting work of the new City Time payroll system, which was touted by Bloomberg. It led to several indictments, while two consultants fled the country in 2011. Bloomberg even demanded a tech giant to return $600 million. In the year 2009, Letitia James won the Democratic Primary against Delia Hunley-Adossa. She went onto win for a second term. 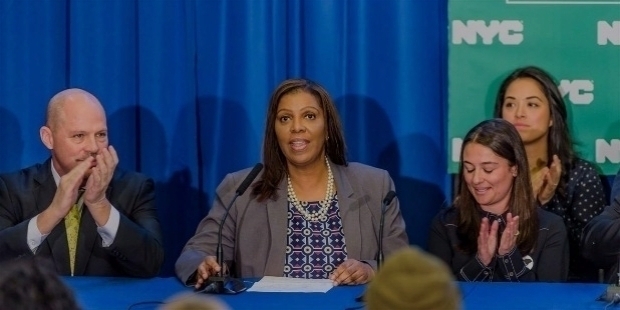 In 2011, Letitia James joined hands with Eric Adams, New York State Senator; Congressman Hakeem Jeffries and Jumaane Williams, the NY City Councilman. They asked Mayor Bloomberg to investigate systematic corruption in the NYPD. She has fearlessly taken on the mighty with great bravado. Letitia James became a part of an Article 78 lawsuit against the Bloomberg administration and Acadia Realty Trust in May 2013. The lawsuit demanded the shutdown of the City Point real estate project and reassessment of its environmental impact. On the 1st of October 2013, Letitia James won the runoff election for New York City Public Advocate against Daniel Squadron. She went onto won the general election with a whopping margin of 83% of the vote. For the Attorney General of New York, Letitia James won the Democratic Primary against Zephyr Teachout and two other candidates. She went onto defeat her Republican opponent Keith Wofford. On the 6th of November 2018, Letitia James was elected the Attorney General of New York. 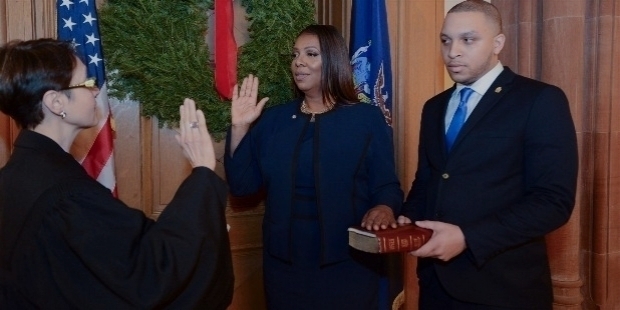 On the New Year’s first day, Letitia James was sworn in as the Attorney General. She succeeded Barbara Underwood. In the recent development of the lawsuit against Opioid manufacturer Purdue Pharma, Letitia James has included eight members of the billionaire Sackler family of alleged financial fraud. It is alleged that they used a number of corporate entities to swindle money through offshore accounts for themselves. New York included in the lawsuit five other companies, who produce opioid painkillers along with four drug distributors as defendants. The number of lawsuits filed by the State and Local Governments are in thousands for putting profit before patients’ safety, thereby fuelling the opioid epidemic.